How my latest project became way more of a project than I thought it was going to be when I started it. When I first met Pat, he had this quilt on his bed. It was soft, slightly tattered, definitely loved and just the right weight to be used all year long. That quilt stayed on our bed for some time – I don’t remember exactly when it was deemed a little too shabby to be used everyday anymore, but I do know it was pre-Edie. I assured Pat it could be fixed, that I could fix it and so I put it in a pile of projects to be worked on and there it sat, for some time. 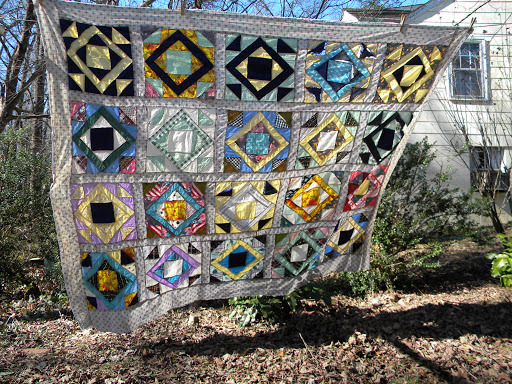 The quilt would come up now & again and I’d think, fixing that quilt would be a great gift for him. We have a number of quilts his grandmother made that I blogged about last year (only I’ve just realized that the images are MIA so I’m not linking that post until I figure out where those images are), but as I have realized, this quilt was different, because it was made by his other grandmother. His maternal grandmother was a beautiful seamstress, quite the quilter and owned a fabric shop at one point. Her quilts are all over our house. 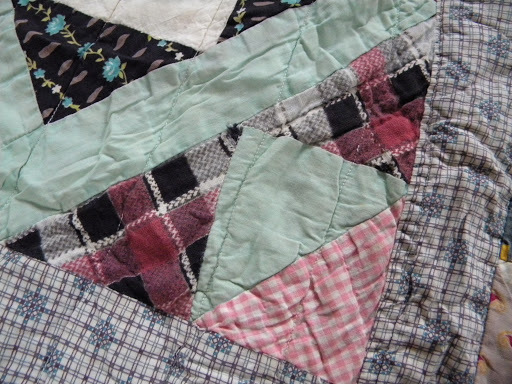 This quilt in question was made by his paternal grandmother, who was not known for her sewing. She was married to a farmer and I don’t think they had a whole lot to their name to begin with when a tornado came through one spring day in the mid 1990’s, leaving them with their lives, but not much else. Pat’s grandfather was never quite the same after that, but I suppose when you are 94 years old and have a house land on you, you’re bound to experience some sort of effect. 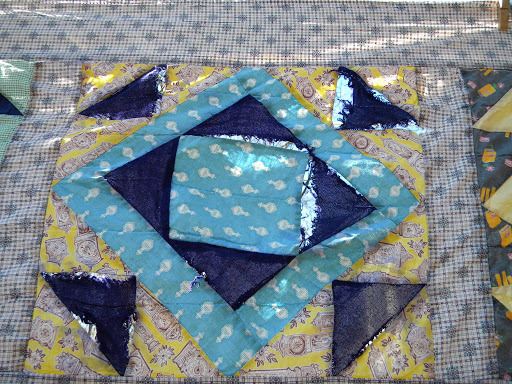 In researching how to repair some of the other quilts around our house, I came to the realization that this quilt needed more than just a few patches and a new binding applied – if I was going to do it right, which I wanted to do, as Pat loved this quilt, not just because it’s one of the few things left from his grandmother, because it was he thought, the perfect sleeping quilt. And doing it right meant taking the binding off, taking the back off, replacing some quilt parts, the backing and the binding. Surely it couldn’t take that long. A few hours with a seam ripper and it would all be good, yes? I thought I could start it just before Thanksgiving and have it done by Christmas. His birthday later this month at the latest. 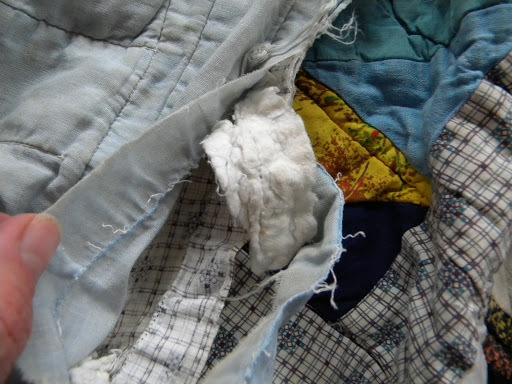 That was before I got into it and realized that this quilt had been quilted through all the layers – top, batting and back. Machine quilted, with lots of tiny, tight little stitches. 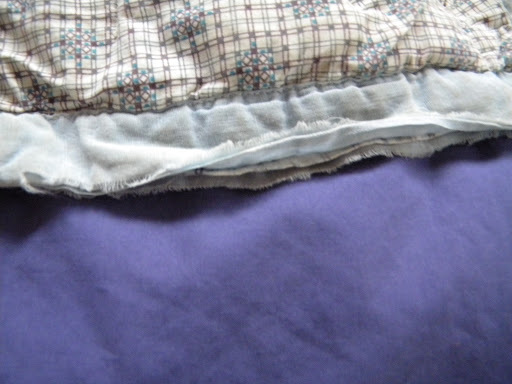 The quilting rows were about 2-3 finger widths apart, and the quilt fits a full size bed. 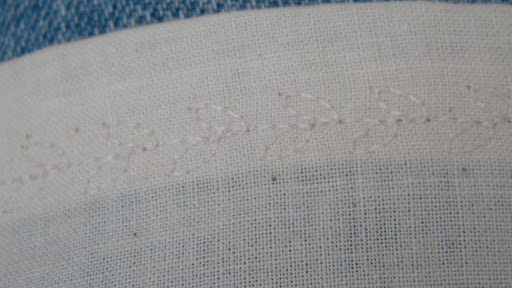 That’s a lot of tiny, tight little stitches to pull out. I literally have to take the entire thing apart. 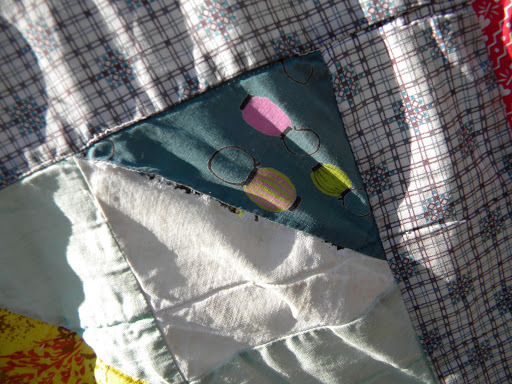 Parts of the quilt are so fragile that I have to very slowly and patiently pull every stitch out as carefully as I can. 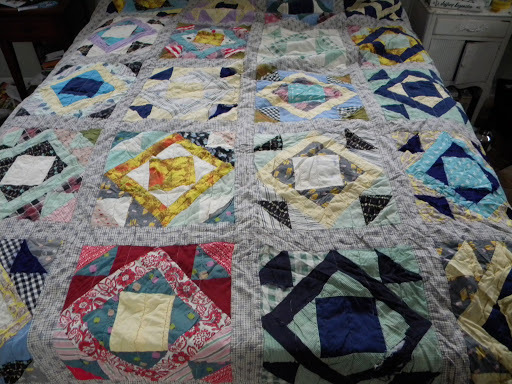 I have spent hours on this quilt, I have gotten friends to sit on the opposite end of the quilt and help me, and for about 20 or so man hours spent taking the quilt apart, I have gotten about a quarter to a third dequilted. I realized as I got into the project that the batting between the layers was disintegrating, leaving a trail of fuzz behind. 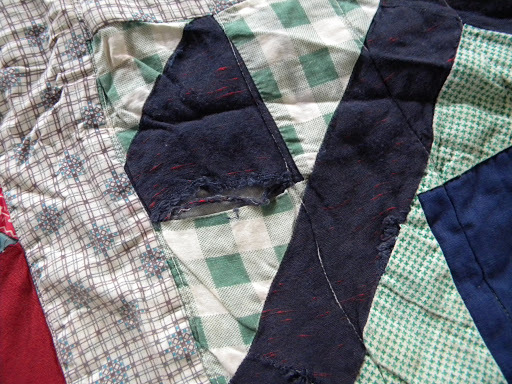 I had every intention of surprising Pat with this project, but between the mess it was leaving behind as well as the realization that this project was going to take far longer than I had anticipated had me share with him that I was finally working on his grandmother’s quilt. So much for the surprise, as well as the idea of it being a Christmas or birthday gift this year. This little project is definitely much bigger than I bargained for. But the quilt itself? It is most definitely a scrap quilt. There are some old flannels that I imagine were shirts of Pat’s grandfather. There are some sweet children’s fabrics, there are what appear to be upholstery fabrics, seersucker, dressier fabrics, vintage prints and more. As I slowly work my way up and down the rows, I wonder where each piece of fabric came from and I ponder what scraps I’m going to use to repair the quilt. As you can see, it’s very much a patchwork quilt, no real pattern, so I think it gives me some room to include some scraps of our lives in it. I never really knew his grandparents, but as I work on this quilt, as I get to know each and every bit of fabric used, I feel like I’ve gotten to know them just a little bit. 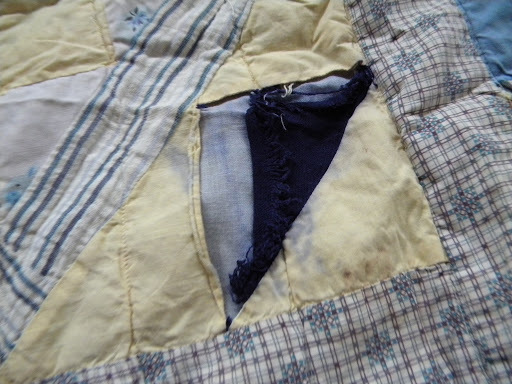 I’m actually glad I’ve waited until now to repair this quilt – had I done it earlier, I wouldn’t have done it right. This way, it will hopefully be around for many more years. But first, I need to get the darn thing apart. This past year has had some big changes in our lives- Pat changed jobs after thirteen and a half years with the Bay Foundation. I lost mine, and then decided to go out on my own. That’s had a pretty big ripple effect and we’re still figuring out what the new normal is around here. I imagine the new year will be continuing along that path. I have a few things in mind that I’d like to see happen in the new year, but I don’t count them as resolutions as much as I do the effect of taking the last few weeks off. Many of them are actually along the lines of what my friend Erin wrote the other day. I really couldn’t say it better myself. How being a grown up is over-rated. I sat down and got spring break planned. At least, I bought train tickets for our trip. I got our summer child care plan figured out – which camps, when. Writing camp, Art camp, Girl Scout camp, and just camp for camp’s sake because we need something that week and I don’t care if cheerleading is the featured activity, it’s alot less expensive than any other option and you can just look at it as a cultural experience and they are touting you’ll learn awesome dance moves which certainly you can take with you and they can come in handy, right? So inbetween all this running around with spring fairs and swimming and soccer and art and working more and having to plan ahead (which really bothers me to no end, I hate feeling I have to be on top of things because if I don’t have my kid’s summer planned by spring break, I might not have any options besides paying a college kid more than I make an hour to sit around my house with my kid but planning that far ahead makes my head spin and makes me think I could cause a late March snowgedden.) I’ve not had alot of time to enjoy this divine weather we’ve been having. Spring has sprung in a most delightful, welcome way, especially after the month of February here (well, December and January weren’t too popular either for a number of reasons, mostly starting with the letter ‘C’ and rhymes with ‘Old’.). 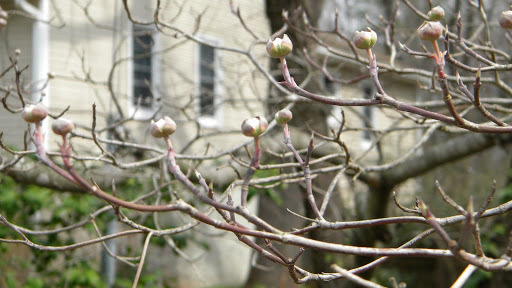 I did find time the other day to sit under the dogwood and notice how it is budding and there are birds checking out the new birdhouse Pat hung on it the other day. 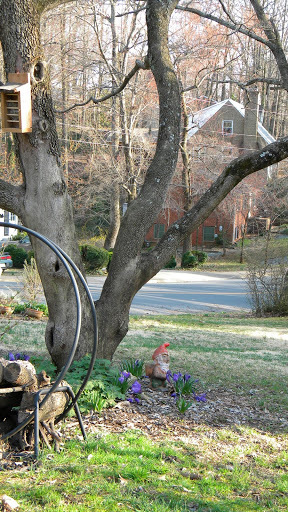 And Garden Gnome seems to have weathered the winter just fine, despite being buried in snow for a good few months. I haven’t had much time to be productive in the way I’d like to be productive – I’ve pulled out the bins of my warm weather clothes, but haven’t yet swapped them out for my cold weather ones, nor have I figured out what’s going, what’s getting altered (a lot of it) and what’s just getting tossed (should be a healthy portion, we’ll see). I haven’t made anything all week besides some lack luster dinners, but I’ve been productive. Spring break and summer are planned as much as they need to be. I started doing some serious restoration in the garden (and am sore all over thanks to it) and got some of the outdoor rearranging I’ve been wanting to get done since last summer, but had to wait until the right planting time, done. Nothing picture worthy though, just replacing the soil and lambs ear border carried away by the floods of late January, moving the butterfly bush to begin to replace the now dead hemlock and moving the lilac to replace the butterfly bush. It took 400 pounds of topsoil to replace what we lost and I still need some more. But, I did get some lounge time in, even if I did need to schedule it and that feels completely wrong to have to schedule. I think I need to schedule alot more and just let some things slide….even if that’s how that basket sits for so long untouched…. 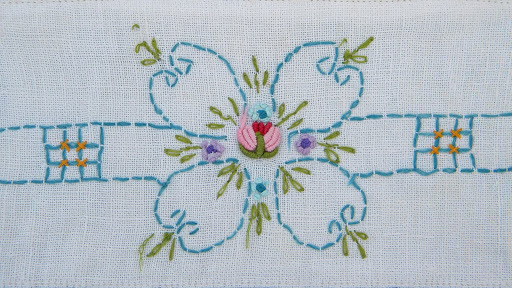 Among the items in the long ignored basket was this vintage embroidered tea towel that had definitely seen better days. I knew I could salvage the good part, but what to do with it? Do you see how flipping sweet that is? It needed a new life and one that would showcase it well. So this Christmas eve, when Pat put a great big box under the Christmas tree, I recognized the paper from the bag Uncle Kevin had dropped off a week or two before. It must be for Edie I thought – I went to bed thinking he’d gotten her something big she’d been begging him for. Was I surprised when the next morning, Pat put it in front of me! And what was in there but a brand spanking new sewing machine! A computerized one no less, a realm I had considered entering, but had no idea where to begin and just not sure I wanted to invest our money in. Problem solved all the way around. 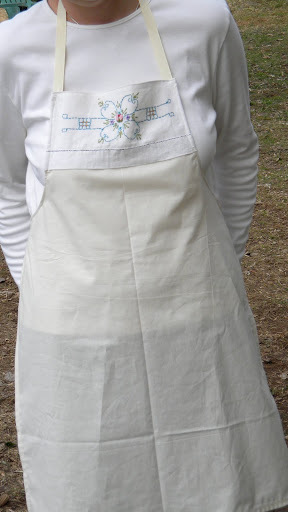 I noticed last time I had visited said uncle that I had left my favorite apron – nothing fancy, just a plain white workhorse I’ve had forever that has definite chocolate and red wine stains. Next time I went to visit, I managed to see the apron, but it mysteriously disappeared before I could pack it. Uncle Kevin mentioned something about perhaps using the new sewing machine to make a new apron to replace it – I’m not sure if I was supposed to make one for me or for him. I’ll admit, it took me awhile to really delve into using the new machine. Between losing my creative mojo there for a bit and then having the learning curve of a new machine, I was hesitant to start a full blown project. I needed the instruction manual in my lap the entire time, the presser foot arm was in a totally different place, how could I really sink my teeth into anything new? It required way more concentration than I had. I’ve played around with it on some little projects – like some applique T-shirts for Edie’s pals – to get my bearings on it. Finally, I started feeling a little more comfortable with it. Really started liking it. Realized it had been way too long since I had a sewing machine that I had any confidence in because halfway through anything on the old one, I would have to stop and take it apart and put it all back together again, fingers crossed I could finish. Half the basket I have sitting there blocking the entrance of the happy corner are things that my old machine crapped out on, that I got frustrated with and put aside. I really started missing my apron. I used that thing almost daily. I decided to make myself a new one, but without the apron in hand, I didn’t have a good pattern for one. But I really needed another full apron. They work so much better for me than those half ones (as evidenced by the stains on the missing one) especially when rolling anything out. My wardrobe choice of wearing mostly black and a love of baking bread need a moderator. A full apron works beautifully in that capacity. I used another apron I have (but admittedly, don’t like the line of as much, but it will have to do for now) and managed to find a way to use some of my fancy new stitches on the hem and the tea towel on the top. A little unbleached muslin, some off white grosgrain ribbon for ties and voila. My first completely finished project with my new sewing machine. Thanks Uncle Kevin. Hand over the apron in question and you will get a fancy new one too, just like it. Well, minus the flowery parts.